No, Canadian Pacific Transport Company Limited was not a trucking operation. It was the motor coach, or bus, division of Canadian Pacific Railway. One of the divisions was head-quartered in Preston, Ontario, operating for the most part in conjunction with the Grand River Railway. Other Canadian Pacific bus operations included Quebec Central Transportation, another involving the Dominion Atlantic Railway in Nova Scotia, as well as the Brandon-Wheatfield airfield operation in Manitoba. All divisions were operated independently of each other. There was no common fleet numbering system tying the various operations together. This page deals with the Preston operation only since it is directly related to the Canadian Pacific Electric Lines. The Canadian Pacific Transport Company Limited began bus service on September 14, 1925 between Galt and Preston in order to compete with Highway King Coach Line, later The Canada Coach Lines Ltd. An extention from Preston to Blair was added later, a distance of approximately three miles. In 1945, CPT buses travelled 109,438 miles carrying 532,911 passengers on the 6.2 mile route between the Galt GRR/LE&N station and the Preston Junction GRR station. On December 29, 1946 the service was again extended, this time from Preston to Kitchener, supplementing the interurban trolley service provided by the Grand River Railway. CPT also operated a limited service from Kitchener to the Canadian Pacific Railway station at Galt, connecting there with Toronto - Windsor/Detroit mainline passenger trains. This service operated in parallel with the electric interurban service of the Grand River Railway. The GRR had a spur line that ran up from their main track, which passed under the Canadian Pacific mainline, to the east end of the CPR station. All a passenger had to do was cross the platform to change from the electric line to a CP train, or vice versa. The buses loaded and unloaded at the west end of the station. When electric interurban service ended on April 24, 1955, CPT buses took over all passenger service between Galt and Kitchener. People travelling south of Galt were served by a privately owned bus operation. 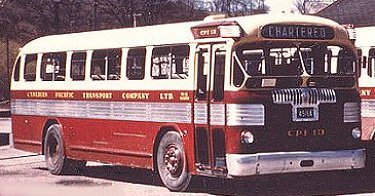 On March 1, 1957, the CPT bus operation at Preston was sold to The Canada Coach Lines Limited of Hamilton, Ontario along with four model 38S Twin Coach buses. However, CPT continued to operate the Kitchener to Galt CPR train connection until June 19, 1961. On a personal note, the Twin Coach 38S is my all-time favourite bus. As a child I had this dream of one day having a chance to drive a 38S, and better still, one owned by CPT. This dream did come true on June 18, 1961, when I drove CPT 16 between Kitchener and Preston. Later I drove bus for a city that operated both the 38S and 41S models. If you know of, or should have any information on the other Canadian Pacific bus operations, or have any additional info not included in the roster below, I would very much like to hear from you. 1 - 3 Fageol 1925 Retired in the mid to late 1930's. Disposition unknown. 4 Twin Coach 23-R 1937 Disposition unknown. 5 Twin Coach 30-R 1937 To Oakville Transportation 5, Oakville, ON. 6 White 805M 7/40 Bender body. Retired by 1943. Disposition unknown. 7 Yellow Coach PG2903 095 9/41 Purchased by Canadian Pacific new possibly for Quebec Central Transportation, Sherbrooke, PQ. From April 1947 to May 1949 it was operated by CPT for the Dominion Atlantic Railway of Kentville, NS and was used between there and Kingsport, NS. In 1949 it was transferred to Preston, ON. Nicknamed 'Queen Mary' at Preston. 8 Ford Transit 1942 Suffered front end damage in a collision. Headlights much closer together after repairs. Disposition unknown. 9 CCF-Brill C36 2140 1946 To a Mr. Boyd, St. Constant, PQ for school bus service. 10-15 Twin Coach 38S 109-114 12/46 10-11 transferred to Montreal, PQ in 1961 for use at the CPR Cote St. Luc Yard. 12-Centre door was made in-operative sometime in the 1950's and a double seat was installed in the centre door area. To The Canada Coach Lines Ltd. 831, Hamilton, ON in 1957. 13-15 Centre door removed sometime in the 1950's. Thirty-seven high-back seats, ex Gray Coach Lines 1400(1st) series were then installed replacing the original seats. To The Canada Coach Lines Ltd. 833-837(odd), Hamilton, ON in 1957. 16-17 Twin Coach 38S 288B-289B 5/47 Both retained for Kitchener to Galt CPR train connections until June 19, 1961. 16-stored at Preston until June 9, 1962. Disposition unknown. 17-transferred to CPR Agincourt Yard, Toronto, ON, for use during its construction. 18 Twin Coach 38S 916C 9/48 Retained for Kitchener to Galt CPR train connections until June 19, 1961. Transferred to CPR Agincourt Yard, Toronto, ON, for use during its construction. Off site page of drawings of selected CPT buses. Preston once boasted its own radio station, CKPC. The 'PC' stood for Preston Canada. The station later moved to Brantford, Ontario, and continues to broadcast from there today.